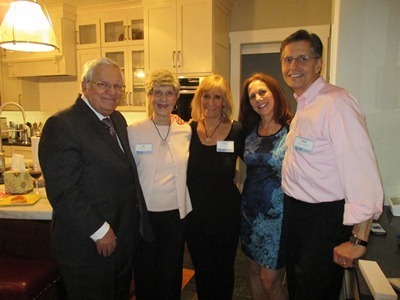 Risa and Steven Aronson recently hosted a parlor meeting in their Newton home featuring guest speaker Joe Hess, a JNF National Board member and Lifetime Achievement Award recipient, who shared his life altering experience as part of the Kindertransport of the 1930’s, which led him to focus on family, social action and the importance of supporting Israel through JNF. Risa Aronson is a member of JNF’s Sapphire Society, the major donor division for women. Steven Aronson is a member of JNF’s New England Board. (L-R) Hess, JNF Sapphire Society and Board member Lee Aronson, Sapphire Society member Bunny Aronson, Risa Aronson and Steven Aronson.